This was one of our best off piste weekends ever. 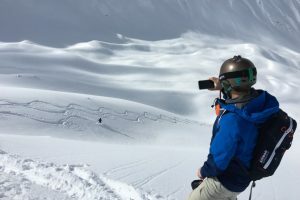 We had fabulous conditions and Bruno (our guide) found slope after slope of fresh powder snow even though it had not snowed for more than a week. 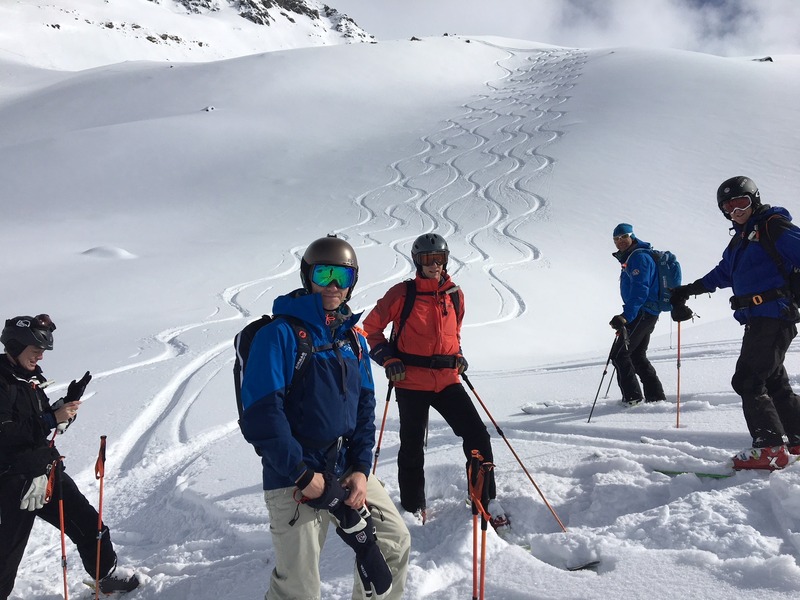 There were 5 guests, Bruno and me (James P-T) and as we headed up the Gotschna on the first morning under somewhat overcast skies we had little idea of what amazing skiing was awaiting us. To ease ourselves in gently we headed up to Weisfluhjoch and headed down one of the classic routes to Wolfgang in the valley below. Bruno managed to find some fairly untracked pitches with decent snow and given that it hadn't snowed for a bit we felt that a weekend like this would not be too bad under the circumstances. So imagine our surprise when an hour and a half later we found ourselves on the Rinerhorn staring down a wide valley with perfect untracked powder snow falling away below us. The whoops of delight echoed around the bowl although there was no one there to hear us. We had this particular Alpine paradise all to ourselves. Eager for more we returned to the top but this time headed the other way, down to the village of Muhle, enjoying fields of fresh snow down as far as the tree line. Muhle is a charming place to have lunch and the team definitely had an appetite for Rosti. Although it was late for lunch, we still had time for a full descent afterwards as Anna picked us up in the PT Ski minibus and drove us round to the Pischa. The steep "Wally" couloir was our afternoon's entertainment and we lost count of the number of turns we put in down this wonderfully steep slope to the valley floor. As we headed out of the valley and back to the road we were delighted to see Anna again with the minibus who scooped us up from the middle of nowhere and whisked us back to Klosters for a well earned drink. With a day like that under our belts we had built up a hunger for more of the same. On Friday we headed again up Gotschna and to the Weissfluhgipfel. After a short descent on the south side we put on skins and climbed up the Zenjifluh (rumours that we were overtaken by a bunch of ladies in their mid sixties are completely unfounded!) for yet another jaw dropping ski in virgin powder. The weather was glorious and photo opportunities plenty. Lunch was at the charming Alte Schwendi and for the afternoon we headed to Madrisa where another of the Klosters classics - Kamarastagge - had our name on it. It was cold and crisp again on Saturday and with the threat of more people on the slopes we opted for a full mountain day on the Pischa and the wonderful Gattschiefer tour. A short steep ski down the back of Pischa was the precursor to a long mellow climb in the sunshine. The skiing on the other side was again sensational and worth every inch of the climb. This was proper mountain wilderness and we were miles from the nearest habitation, road or ski lift. 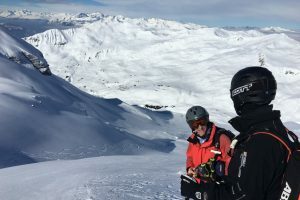 The second climb was shorter and from the top we were able to look down on to Klosters, with wonderful ski slopes between there and the bottom. All too soon it was our last day and the cloud had come in, albeit it was still sunny at the top. The answer was to stay high and after warming up in Ballantyne's Couloir we then headed back to the Gifel and had a few heart fluttering moments in the very steep Radar Couloir which was a little more icy and a little less soft than expected! We finished skiing at just after 2.30pm and after a quick pizza and change back in Klosters we were in the minibus and heading to Zurich Airport and back home. It had been a quite sensational four days which endorsed Klosters's reputation as one of the premier off piste resorts in the Alps... thankfully this reputation is known only by a discerning few and disbelieved by the many who flock to more fashionable big resorts, so glorious weekends like the one we just enjoyed should remain the norm for many years to come. 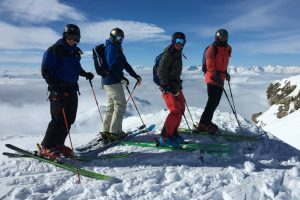 PT Ski will again be running off piste weekends in winter 2019 and the dates should be published on the website in early April.